What is happening in the Middle East and Africa to Christians – rapes, beheadings, hangings, crucifixions, being driven from their ancestral homes and looted of all their worldly belongings…even churches have not been spared…is truly heart breaking. The world appears indifferent to the continuing slaughter. There is a frightening silence from ‘Christian’ countries that borders on the criminal. It is the Jews that have taken up the cause of the Christians for they are aware of what happens when a religious community is persecuted by a State : they faced gas chambers in the last century. The Nazis drew the Star of David on all Jewish homes, which were then confiscated by the State. 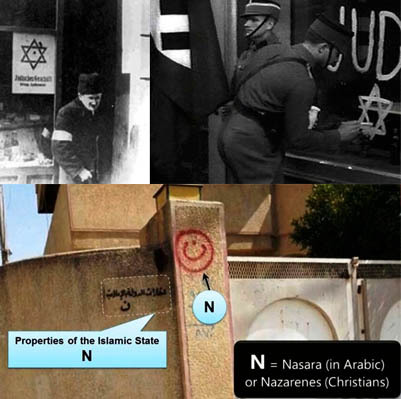 While the Islamic State is painting the sign ‘N’ which means Nasara in Arabic or Nazerenes (Christians) on all Christian homes and businesses. This is followed by a statement that the confiscated properties belong to the Islamic State. The 2000 year old Christian community in Mosul has been decimated. Not one poor soul remains while churches have either been destroyed or converted to mosques. 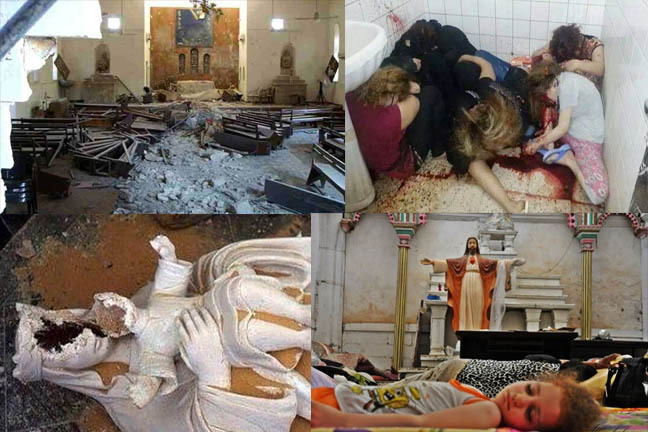 Christians in other parts of the Middle East continue to hounded like animals, beaten and killed for their faith. In parts of Africa there appears to be a insidious campaign to exterminate Christians. And will anyone stand up for the Christians? We Need to activate the knights Templar again and protect the church’s as needed, this is not the way G-D expects us to let Jews or Christians be treated.